George Washington LIVES! : GW Statesmanship, Acting Revolutionary! "First in War, First in Peace, and First in the Hearts of his Countryman, he was Second to None..."
...who take the time to learn of his prime example of sterling character, and his legacy of leadership! GW = Gigsalad Website ? Sign GW Lives! up Now, add Life to future meeting! Be a WISE Man (male or female) ~ Sponsor GW Lives! GW on Why Learn History? GW Lives! All Across America Journey, by George! / headline "National Treasure"
This GW Lives! web-log (or 'blog') has been created using Firefox, and so it appears best with Firefox. Microsoft Explorer gives wacky renderings, and even Apple Safari is a off from time to time, so why not download a free version of Firefox? And remember because GW so often "out-foxed" them, the British called Gen. George Washington "The Fox"! GW - Golden Wordsmanship! or "Wooden Teeth"? About the Aide to "GW Lives!" "Master of American History" per John McCaslin of The Washington Times on 29 Nov 2005; in 2003 wrote a "Revolutionary" Christmas play telling of the true first Statue of Liberty of a black boy soldier - who gave his life for your Liberty; in 2002 in-person history work was compared by Delegate Lee Ware to the work of David McCullough in books; from 1998 to 2001 former member of the Board of Visitors to Mount Vernon appointed by Governor Gilmore. At age 12, wrote a 168 page paper on the War Between The States encouraged by my mentor from church, Ralph McGill. *** McGill was the Publisher of The Atlanta Constitution, and instructed me at age 10 to read and love "tHis Constitution FOR the United States of America" because as a young reporter, McGill witnessed the Austrians vote away their written Constitution for the promises of the government, the Nazi government! I ask how far are we in America from voting away our God given Constitution? *** Ralph McGill received the Presidential Medal of Freedom in a.d. 1964, and the Pulitzer Prize in a.d. 1959. I was blessed by McGill's mentorship for he was called: "The Conscience of the South". and of the Constitutional Convention. Not all “Acts” are “pretend” or fiction or drama, even though dramatic. In life are Acts of Courage, Acts of Kindness, Acts of Prayer, Acts of Grace, and Acts of God. 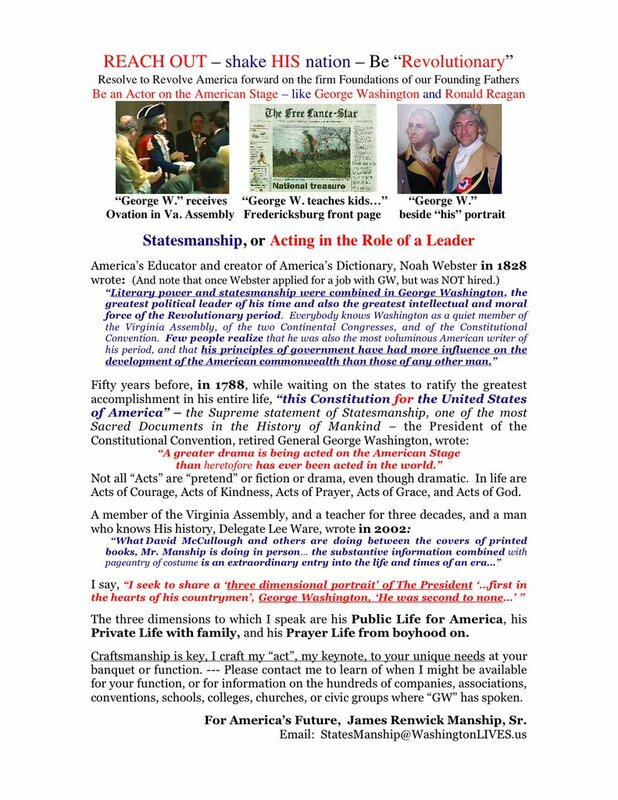 I say, “I seek to share a ‘three dimensional portrait’ of The President ‘...first in the hearts of his countrymen’, George Washington, ‘He was second to none...’ ” The three dimensions to which I speak are his Public Life for America, his Private Life with family, and his Prayer Life from boyhood on. Craftsmanship is key, I craft my “act”, my keynote, to your unique needs at your banquet or function. 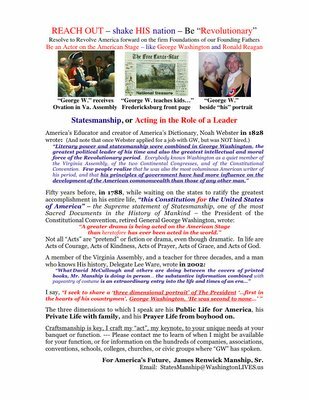 --- Please contact me to learn of when I might be available for your function, or for information on the hundreds of companies, associations, conventions, schools, colleges, churches, or civic groups where “GW” has spoken. For America’s Future, James Renwick Manship, Sr.
Test of the moderated comment function of the blogspot.